I had been lusting after the burnout Robert Rodriguez sweatshirt, however, it was a special edition and not available for purchase. I did an extensive internet search to find a suitable replica but I was unable to find any good alternatives. 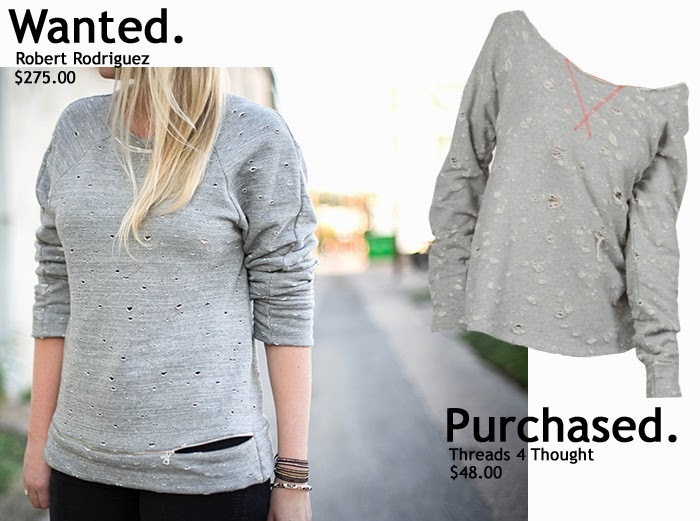 While browsing through my favorite magazine, People Stylewatch, I happened upon the Threads 4 Thought sweatshirt featured above - I honestly couldn't believe my luck. I am incredibly happy with my purchase. Also, the fact that the Threads 4 Thought sweatshirt was a quarter of the price of the Robert Rodriguez one just made my find that much sweeter. *Photograph taken from Style Scribe. Collage created by me.